The group is comprised of two seperate entities and sites. The first, in the centre of Angers: the lycée, the general and technical high school. Students from the ages of 15 to 18 prepare for the Baccaluréat. The second, on the campus at Belle-Beille: the Campus Sacré-Coeur La Salle. Students aged from 18 to 22 continue their studies in higher education. We welcome high level young athletes, in partnership with Angers SCO Football Team, Angers SCO Rugby Team, and Angers Natation (Swim Angers). Angers, jewel of the Loire Valley (a UNESCO world heritage site), is easily accessible from Paris by train (1h30), or by car (3h), and is one hour from the airports of Nantes and Tours. 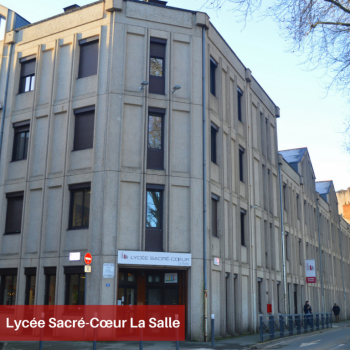 The Lycée Sacré Coeur La Salle (SCLS) is situated in the heart of the historic town centre, on the banks of the River Maine. It is 15 minutes walk from the train station and is served by both the bus and tram. Voted the number one town in France to live in, Angers is a green, dynamic, and pleasant city with a population of 40,000 students.